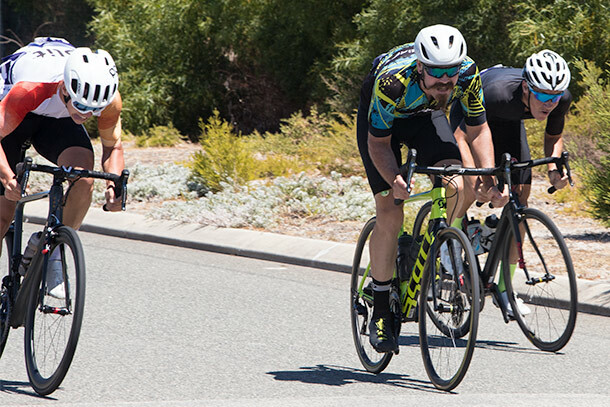 The final race of the Peel Districts Cycling Club summer criterium series is the Club Championships. Which also sees the awarding of the Lara Devenish Memorial Trophy for the most combative rider.across all grades. Clint Hort made his intentions known from the end of the first lap of D grade when he attacked, the end of the next lap he had a 20 second lead, end of the following lap the lead was 40 seconds. 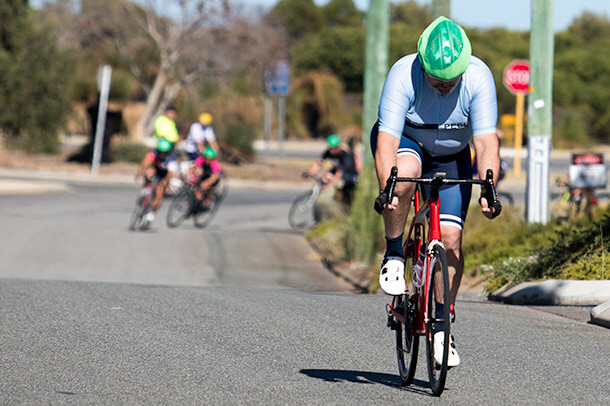 Even with wide flat roads and long straights of the Alumina Way circuit, Hort was now out of sight of the chasing bunch. With only three out of ten riders willing to work and the chase disorganised the gap hovered around 40 seconds for most of the race. After twenty five minutes, Hort started tiring, the bunch had cut the lead and could see their prey. With a lap to go the lead was only 20 seconds, indecision by the chasers, saw a determined Hort maintain the margin and take the solo win. Peter Washington jump out the bunch on the back straight to take second, with his son Sam Washington claiming third in the bunch sprint. C grade was not going to let a break get away, every attempt was quickly chased down, which was usually followed by a counter attack as other riders tried and failed. A flying final lap saw Mark Glorie lead a very strung out bunch through the final corner. Glorie showed his strength, powering into the headwind and the slight pinch to take the win. Ashton Sime was second and Kurt Harmer third. The junior two lap race, saw the return of the Rhys Dawson and Chris Hort rivalry . Hort sprinted away on the slight rise to the line to claim the honours for this race. B grade was another aggressive race, with riders attacking and getting off the front, for a lap or two. They then would brought back, other riders would counter attack and the chase would be repeated. An attack and chase on the back straight, saw riders taking a lot of speed and a wide line into the final corner. Callum Milne took the inside line and got the jump on his fellow competitors and managed to hold it to the line to take the win, Kelana Saleh was second and Clyton Carlye third. Mikey Hoskens attempted to repeat Clint Hort’s heroics, attacking at the end of the first lap. At the end of the second lap he had 20 second lead. The bunch started chasing and slowly reeled him back, The next few laps saw Hoskens sitting on the front driving the pace or chasing down attacks. The suddenly Hoskens was off the front again and again he was chased down. With two laps to go Hoskens was at the back of pack. Not for long, Hoskens attacked again, rode the fastest lap of the race to get the bell for one lap to go clear of the chasing pack. Hoskens maintained his lead and rounded the final corner clear of his pursuers. The last 100 metres, the slight pinch and headwind were just too much for Hoskens and he was caught 5 metres from the line by Mitchell Lees, Hoskens held on for second ahead of Wade Longworth. For his efforts Mikey Hoskens was awarded the Lara Devenish Memorial Trophy, with Clint Hort receiving a honourable mention from the judges.